Original article by Tristan Cork for the Bristol Post newspaper. It would normally be trying to sell products and getting in the way, but when the people of Southville, Ashton and Bedminster strolled along North Street on Sunday (March 25), they discovered someone had subverted their usual street scene. 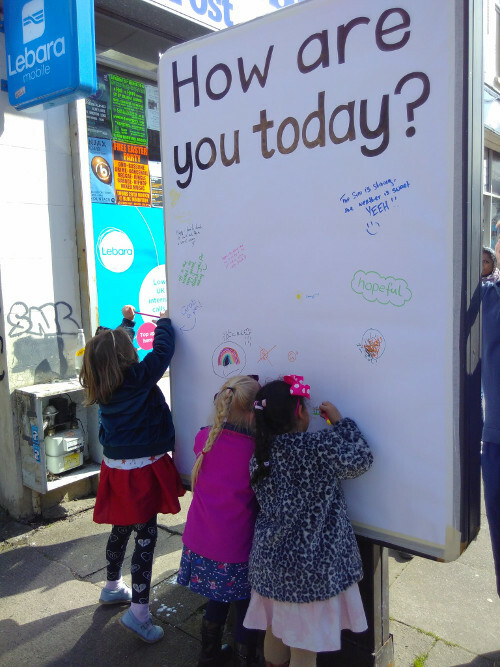 An electronic billboard in one of Bristol’s busiest streets was transformed into a whiteboard space for Bristolians’ thoughts and feelings – as part of a global day of action against outdoor advertising in public spaces. The billboard stands in the middle of the pavement on the north side of North Street in Southville, but instead of advertising shampoo or car insurance it was completely covered over with white paper. 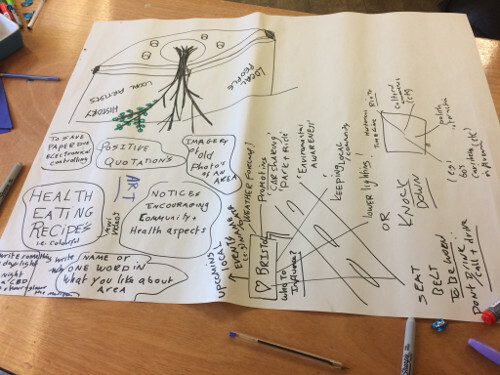 And, on one side, coloured pens were left in a pot with the invitation to passers-by to get creative on the new space. 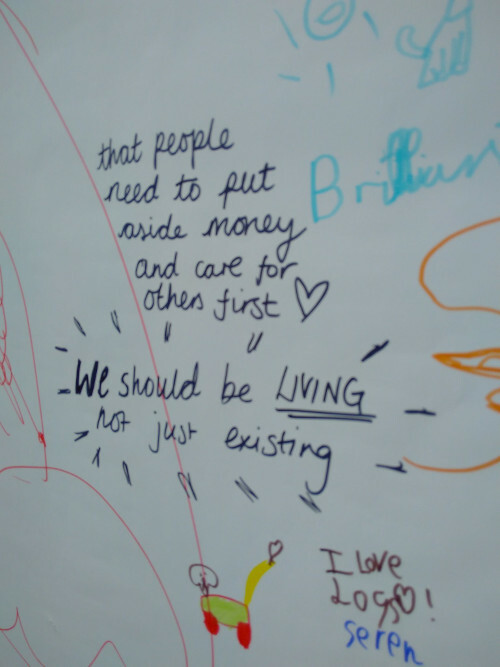 Within just a few minutes, the adults and children of BS3 had begun expressing their love for cats, mountain bikes, Brexit, Sundays, sleeping and cake. Children drew pictures and wrote things, adults wrote things higher up – and remarkably it seemed no one wrote rude words or drew pictures of genitalia within at least the first six hours of the paper being up. The bit of guerrilla subversive anti-advertising was carried out by campaign group Adblock Bristol, who claimed responsibility for the action – they didn’t have permission. Adblock Bristol has led a string of campaigns against the increasing amount of advertising space, billboards and the like, in public areas in Bristol – from fighting plans for illuminated billboards alongside the M32 to campaigning against council plans for more advertising in the city’s parks. “Around the world, artists, residents and communities are taking action to reclaim public space from the bombardment of corporate advertising messages which tell us that buying things will make us happy,” said Robbie Gillett from Adblock Bristol. 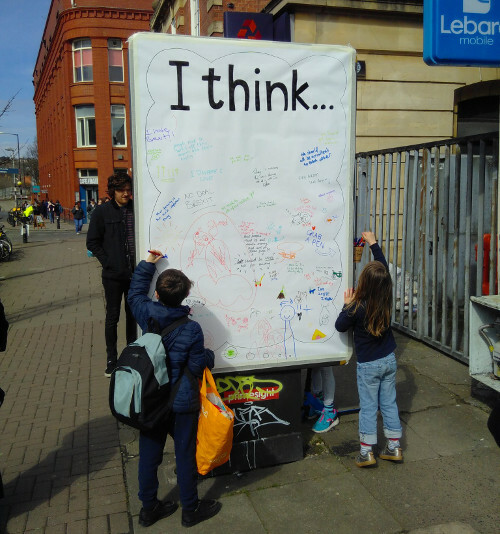 The action on Sunday 25 March 2018 was part of ‘Subvert The City’, an international weekend of action against outdoor advertising, which included a workshop in Easton on Saturday (24 March 2018) to discuss community alternatives to the ‘corporate ownership of outdoor ads in the area’. In Lyon, protestors marched through the city calling for ‘Trees Not Ads’, and there were other actions in Madrid, London, New York and Berlin. “Being constantly exposed to commercial advertising undermines our mental health, our wellbeing and our environment. “We want these corporate billboards removed so that we can live in a happier, less stressed-out city, which values local communities, our public space and our creativity,” he added.